Foreclosure List (Old Format): This is the OLD version of the foreclosure list. 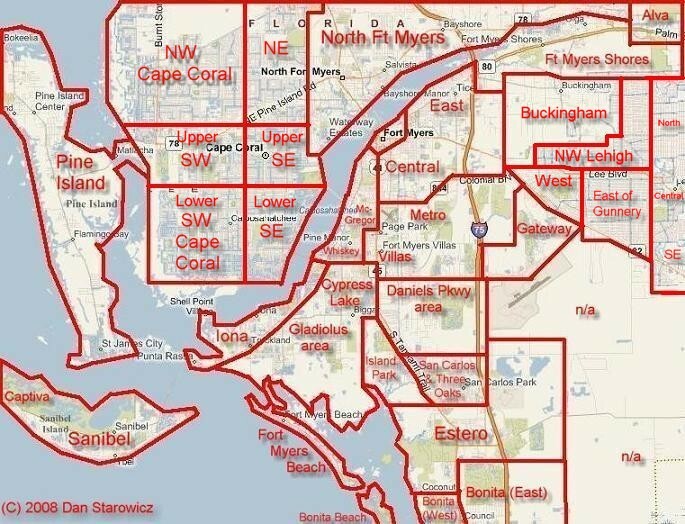 While still functional, it has been replaced with newer versions which cover more area: Go to the new SW Florida Foreclosure list here or the new SW Florida Gulf access Foreclosure list here. If continuing with the older format below: Simply click on the section of the map below to view that section’s current foreclosure inventory. If you don’t know the area well enough, it’s highly recommended to read this area overview first! Want Gulf access foreclosures instead? They can be found at this link. Should you come across any you find interesting feel free to call me at 239-603-6100 for additional info! All Area Foreclosures: This is the old version of the foreclosure list. While still functional, it has been replaced with a newer version which covers more area: Go to the new SW Florida Foreclosure list here. If continuing with the older format below: The map below pertains to ALL area foreclosures. Simply click on an area of interest on the map. For waterfront foreclosures only (ocean/gulf access) go to this link instead. Waterfront foreclosures (Old format): This is the old version of the waterfront foreclosure list. While still functional, it has been replaced with a newer version which covers more area: Go to the new SW Florida Gulf access Foreclosure list here. If continuing with the older format below: The map below pertains to WATERFRONT foreclosures including sections, as noted, with Gulf [ocean] access. For MANY more advanced waterfront search options please visit my Southwest Florida waterfront property search page at this link instead (older website format). The data relating to real estate for sale on this web site comes from the Broker Reciprocity Program (BR Program) of the multiple listing services (MLS) in which this Realtor® participates. Information provided is thought to be reliable but is not guaranteed to be accurate; you are advised to verify facts that are important to you. No warranties, expressed or implied, are provided for the data or for its use or interpretation by the user. * Data parameters are at my discretion and may not include every foreclosure on the market.